How The Hell Did I get From Tom Molineaux to Mikhail Bakhtin? 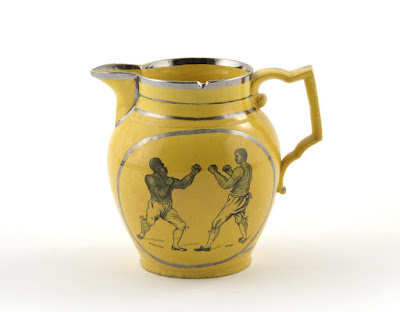 This jug depicts an infamous prizefight in 1811 between the champion Tom Cribb and the challenger Tom Molineaux. Molineaux was born a slave in Virginia. He won his freedom and went on to find fame first in America and then in England. This image is one of many that featured Molineaux. Portrait painters were fascinated by the athlete, as were cartoonists of the era. As I look at this, I see many parallels to Deerfoot, the Indian runner who I mentioned in an earlier post. They were both members of alienated populations; they both traveled overseas to find a measure of fame; and they both died in relative obscurity. They also lived on as legends in their sports and relative communities. So, yes, images continue to be important in my research and writing. And I keep thinking of how to talk about them in meaningful ways that develop my narrative rather than simply illustrating it. Fortunately, tomorrow I'm going to my favorite "summer camp for academics," a.k.a. the annual meeting of the Society for Values in Higher Education. This year's event is in Oberlin, Ohio. If you are going, I look forward to seeing you there. If you are not, I now think a little less of you. You can make it up by attending next year. One of the gems of this conference are the "morning seminars." Basically, each seminar has a particular focus--my regular stop is the "Theorizing Culture" group. The organizers pick readings that connect to the conference theme, and then a group discusses the readings. EVERY year I come back from this with new ideas for teaching and research. This year, we are reading some material from Mikhail Bakhtin. Honestly, of what I could muscle through so far, I feel like I'm reading directly from the academic sentence generator. Still, I'm thinking that this business about the "carnivalesque" is going to prove useful in my writing. The discussions will help. They always do. Last year, I had all sorts of trouble understanding Jacques Rancière's The Ignorant Schoolmaster. But after the discussion and some re-reading, I have been thinking about him ever since. I expect to be away from blogging for a while. Maybe when I come back, I'll have something appropriately Bakhtinian to blog about... such as how this post got from Tom Molineaux to Mikhail Bakhtin. That's something that only a literary critic could make sense of. Maybe.